This image shows the Vela pulsar wind nebula as observed with ESA's INTEGRAL observatory (blue pixellated image) and with other high-energy astronomical facilities (coloured contours). The INTEGRAL image shows emission detected at hard X-ray energies, between 18 and 40 keV, with the IBIS imager on board INTEGRAL, after subtraction of the point-like source corresponding to the inner nebula. 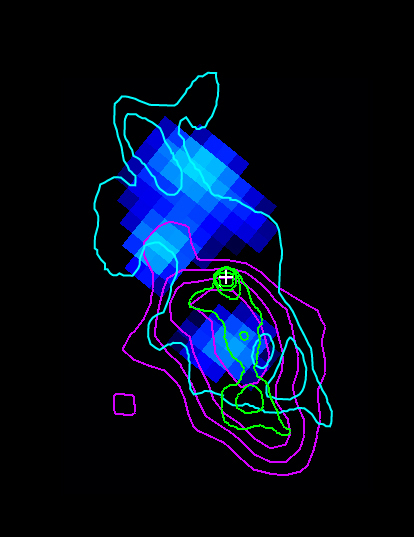 The contours show soft X-ray emission detected by the German ROSAT telescope between 0.5 and 2 keV (green) and by the Birmingham Spacelab 2 telescope between 2.5 and 12 keV (cyan), and very-high energy gamma-ray emission detected with the H.E.S.S. Telescopes above 1 TeV (magenta). The image measures roughly two degrees on the horizontal side. North is up and East is to the left.